From Babies with Love has some of the most ethical gifts on offer to parents-to-be and children this Christmas. For starters, every penny of profit is used to help abandoned and orphaned children all over the world. 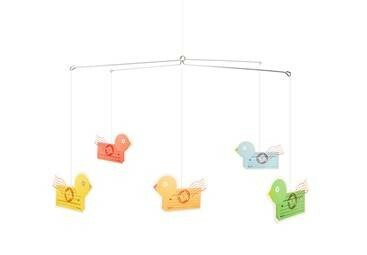 This, combined with the fact, From Babies with Love gifts are all made using GOTS certified organic yarn. Then add to the mix, recycling and upcycling and you’ve got the ultimate ethical gift! To date, From Babies with Love has assisted over 500 children in 25 countries worldwide. With the purchase of these gifts, there’s hope to assist 2,000 vulnerable children within the next 12-months. Charity Bear – Young children will adore From Babies with Love Charity Bear (£18.99 RRP). No ordinary bear, this bear has been designed in collaboration with Boots to deliver on an environmental and social level. Suitable from birth, this soft, cuddly, beanie bottomed bear not only brings hours of comfort and joy to its owner, but it’s also considerate to the environment and helps provide much needed care to less fortunate children around the world. What makes the From Babies With Love Charity Bear special? 100% of profits from every sale are donated to help orphaned and abandoned children worldwide through SOS Children: SOS Children helps build and run children’s villages around the world. The villages provide a safe and loving home, as well as fundamental education and healthcare, to children who have nobody else to turn to; enabling children who would otherwise be left to fend for themselves, on the streets or in slums, to have a second chance in life. NO chemicals, NO dyes & NO pesticides: The bear and bib are made from luxuriously soft, organically grown, natural coloured cotton without the use of chemicals, dyes or pesticides. 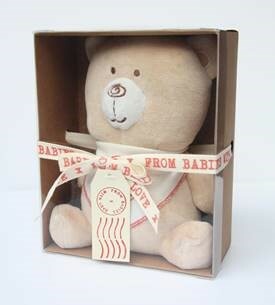 The From Babies with Love Charity Bear is presented in a beautiful gift box, with a hand-tied bow and From Babies with Love label. It is available to purchase exclusively through Boots (in store & online). Baby Gift Sets – Parents-to-be and new parents alike will adore the From Babies with Love Gift Set. 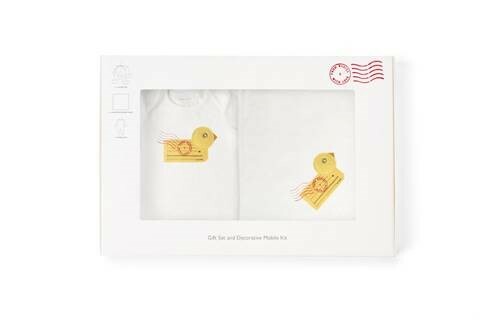 Each gift set comes with a useful baby grow and blanket – ideal for the winter months – complete with peace of mind that somewhere in the world another child is also benefiting from this gift (£49.95 RRP). The four stylish designs, feature charming animal motifs: The Rabbit, The Duck, The Frog and The Monkey, which have been cleverly created using a montage of vintage postage ephemera to unique effect. High quality screen-printing and hand finished applique details complete a premium finish and feel, while the luxuriously soft organic cotton is ideal against baby’s sensitive skin.